If there any kid alive who doesn't like things that glow? I know my kids love them. When they get one of those little glow sticks its like they just won the lottery. 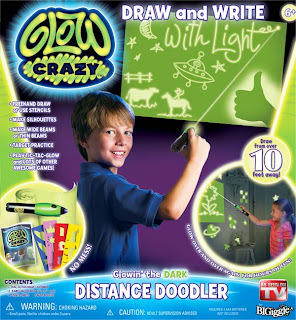 So of course, they went crazy when they saw the GlowCrazy Distance Doodler, and I have to admit, even I though it was pretty cool. The GlowCrazy Doodler looks like of like a laser pen. When you press the button it sends out a stream of glowing light. When it hits the special poster paper that is included in the doodler package, kids can create cool glowing designs on their walls. You can be standing on the other side of the room with the glow pen and it still works. But the really cool thing is that after a little while the pictures fade so you can use it again and again. It leaves kids with endless possibilities for nighttime fun from great works of art to games of tic tac toe. And best of all, it doesn't damage your walls like glowing decals. The GlowCrazy Doodle Magic Lightwand set comes with 10 feet of paper, stencils, and the GlowCrazy Distance Doodler and more. It is available for the low price of $24.99 plus shipping. You can order it online at the GlowCrazy website. This is a fun and original toy that kids everywhere are going to love. Get yours today and watch your kids face glow with happiness. One lucky winner is going to receive a Glow Crazy of their very own. To enter, just visit Glow Crazy and tell me something you learned. For additional entries you can do any of the following, but you must complete this initial entry first. Any entries that do not follow these guidelines will be deleted. This giveaway will end at midnight on 2/26/11 and is open to the US only. The winner will be chosen via a random number generator. Thanks again to GlowCrazy for offering this great prize! You can use this from a far away as 10 feet. Looks like a lot of fun! I learned that the glow canvas sheet can be put anywhere...even the ceiling! This would keep the kids busy for hours! i learned that it works 10 feet away! I learned you can make silohettes. I learned you can use it from ten feet away. Thannk you for offering this. I already follow your blog on Google Friends Connect, thank you. I Liked you on New Age Mama on FB, thank you. I am following your author blog, thank you. I am following your author blog on FB, thank you. I learned it works from over 10 feet away. It can be used for target practice. I am not sure if my husband would share with the kids! it works from 10 ft away- my son would love it. I learned from the video that you can put the canvas on your ceiling and draw while you lay in bed! Fun! I learned that it works from over 10' away. Thanks! I learned you can make wide or thin beams. I learned that you can use it from 10 ft away! I learned that it can be used from 10 feet away. Fan of NAM on FB. I follow your author blog on Twitter. I follow your author blog on FB. I follow you on Twitter (@littleamberfate). I learned that it can work from 10 feet away...pretty cool ! I learned that it can be done free hand or with the stencils! This has a removable glow canvas. That is so cool. I learned it makes thin and wide beams. Glow Crazy has another site called the "glowtivity center" where they are developing experiments and activities for kids and lessons for parents and teachers to use. I learned you can free draw or use stencils. I learned it works up to 10 feet away. It comes with fun stencils. I learned that you can hang the canvas anywhere so you could proboaly put it on your ceiling, lay in bed and doodle.